Councils are set to benefit from a £50million funding boost to create additional school places and state-of-the-art facilities for children with special educational needs and disabilities (SEND), giving families more choice and helping to meet increasing demand. Alongside this, the Government has provided £680million to create 40,000 more good school places in primary and secondary schools, building on the 825,000 new school places created since 2010. The funding boost comes as new analysis shows 91 per cent of school places created last year were in good or outstanding schools. The additional investment in school places for children with additional needs announced today (Tuesday 29 May) builds on the £215million fund announced last year to ensure children with SEND had access to a good school place. Today’s boost could help create around 740 more special school places and provide new specialist facilities to support children with complex needs, such as sensory rooms and playgrounds with specialist equipment. The combined investment is part of the £23billion being spent by the Government between now and 2021 to ensure every child regardless of their needs, background or circumstances has access to a good school place so they will be able to fulfil their potential. "All parents want to send their child to a good local school, one that meets their individual needs and supports them to achieve their full potential, regardless of the challenges they may face. This funding will help to create thousands more school places across the country, with a clear focus on transforming the experience of education for children with special educational needs or disabilities (SEND)." Today’s announcement aims to remove some of the barriers to a good education for children with additional needs and make sure Britain is a country that truly works for everyone. The funding brings the total investment in new school places for children with additional needs to £265million, following the announcement of a £215million fund last year. Over half the councils in England will receive more than £225,000 to increase places or improve schools for children with SEND, and every council will receive at least £115,000. The Government has also today published new school places scorecards which show 91 per cent of all primary and secondary school places created in 2016/17 were in Ofsted rated, ‘good’ or ‘outstanding’ schools. The scorecards show how many good school places councils have delivered, and how well they meet the demand of local parents. "The NNPCF are pleased to see the announcement from the Department form Education regarding an increase in the capital spending to increase places or improve facilities in schools for children and young people with SEND. "Specialist provision continues to be under great pressure across the country and it is vital this money makes the greatest impact. We are pleased to note that local authorities will need to work with parent and carers to determine how it is most effectively spent." "We welcome any increase in funding that will help inclusion of children with additional needs in mainstream schools. Schools have a duty to be accessible, but we know from calls to Contact’s helpline that this is not always the case. Some schools lack capacity in their specialist units, or do not have a quiet room for children with sensory issues or adequate changing facilities for children with personal care needs. We hope that this top up funding together with the £215m announced last year will help make a visible difference. "Parent carer forums - networks of parent carers across the country - can help ensure this happens by working strategically with local authorities, Clinical Commissioning Groups (CCGs) and others to make sure the views and opinions of families directly influence the services that affect them." These measures build on the Government’s reforms to improve the lives of children and young people with additional needs, through the introduction of the new Education Health and Care (EHC) plans, helping to ensure children have access to a world-class education, with facilities and support that meets their individual needs. Overall investment in educational provision for provision for children with SEND was £6billion this year, the highest on record. Earlier this year the Government launched a call for evidence looking at ways to improve educational outcomes for vulnerable children as well as an independently led exclusions review looking at how they are used and which children are most likely to be targeted. 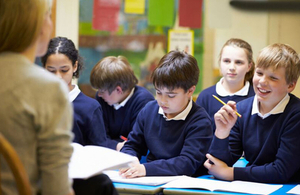 The Government is investing more than £23 billion in the school estate by 2021. The £680million announced today includes the basic need allocations for 2020-21, expected to create 40,000 new places. The new places build on the hard work of teachers and the success of the Government’s reforms, creating 825,000 new school places since 2010 with 1.9 million more children now in good or outstanding schools.